"'They came against her as a child. Now they face the woman. A battle in which hearts will be broken, lovers lost, thrones burned." 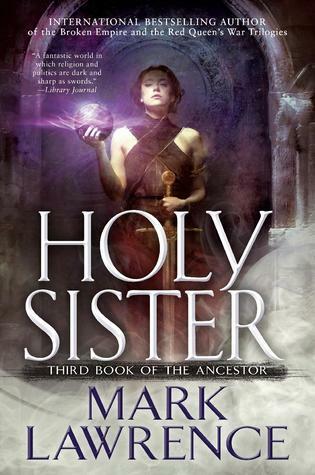 Holy Sister is the third and final installment in Mark Lawrence's Book of the Ancestor series, and it proves to be a fantastic conclusion. This final book picks up immediately after the events of Grey Sister and takes off from there, plunging us right back into the intense and unpredictable world of Abeth. The pacing in this book feels perfect. The majority of the book switches between two main timelines: the present day (three years after the events of Grey Sister) and immediately where Grey Sister ended three years ago. This setup led to an even mix of fast-paced adventure and slower plotting and explorations, as well as a great deal of anticipation from knowing how some things turn out in the future, but still having to go back in the past to discover and understand the why and what led to the current state of things. Everything felt so effortlessly planned out, and this is something that I always love about Lawrence's writing. He manages to make everything feel wrapped up and fully explored without making things too neat or tidy. One of the strongest points of this book, and indeed the entire trilogy, is the characters and their development. Nona's journey is remarkable to follow, and her relationship with the other girls at Sweet Mercy is endlessly compelling and full of depth. The loyalty that Nona exhibits throughout all of these books is rewarding to read, and it was such a satisfying experience to watch her continue to follow her values and loyalties even throughout the events of this final book. The remaining characters are just as well-developed as Nona and bring a great of intrigue and personality to the narrative. I love a school setting as much as anyone, so this novel focusing less on that is a little disappointing, but also completely understandable--one can't stay in school forever!--and still enjoyable for all of the other settings and adventures we get to explore. However, I enjoyed seeing a bit more of the real world applications of the various characters' powers and to see everyone's strengths come out. The world-building setup and lessons learned from the prior books really came into play here and I felt like Holy Sister allowed me to explore this unique world even more. The ending is powerful and bittersweet. I even re-read many portions of the last fifty or so pages to fully grasp everything that was happening. As I mentioned earlier, Lawrence does a great job of answering a lot of lingering questions throughout the trilogy and wrapping things up, but he also leaves a satisfying amount of things open with some potential. It's nothing major, but it's there, and I really love that in any series when I'm able to feel like their is still more happening in this world, whether I get to see it or not. I certainly didn't expect the ending that we got in a lot of ways, so I say bravo to Mr. Lawrence for continuously keeping me on my toes. Overall, I've given Holy Sister 4.5 stars! I really loved and enjoyed this book, but I have to say that it's hard to come close to how fantastic Red Sister and Grey Sister are. Nonetheless, this is a wonderful conclusion to a truly phenomenal trilogy and I'm so glad I had a chance to read it. I look forward to reading even more from Lawrence in the future (in particular, his latest release One Word Kill! ).